How You Can Create A First Aid Team and Assemble Comprehensive Dog First Aid Kits! By Denise Fleck, certified Pet First Aid & CPR instructor, author, creator of Sunny-Dog Ink Pet First Aid Kits - With Vicki Rae Thorne, certified aromatherapist, herbalist, founder & owner of Earth Heart Inc.
What Is Pet First Aid? Veterinarians are the experts, but most of us are not lucky enough to have a vet-in-residence 24/7, and even if you live in a house with other people, odds are that when the dog stops breathing or the kitty cuts a paw, you will be home alone and it will be after veterinary hours. That’s why it’s so important that pet parents know how to jump to the task to rescue Rover or help Fluffy feel better before professional medical help is available! · If you know how to lower your pet’s body temperature due to heat stroke, you can prevent brain swelling and gastrointestinal injury. · If you know how to stop bleeding, you can prevent your precious pet from severe blood loss on the way to the vet, and through proper bandaging you can help prevent infection. · If you know how to induce vomiting, you can expel poison from the body. · If you know how to alleviate choking, you can prevent your pet from going unconscious. · If you know how to perform Rescue Breathing and CPCR (a second “C” for cerebral means improved techniques for moving blood and oxygen to the brain), you can keep that life-giving blood and oxygen circulating, keeping the animal alive until you get to medical help. Why Is Attending A Class So Important? Reading a book or even watching a video is helpful, but not a replacement for actually attending a class where you can view demonstrations and participate in hands-on skills practice which enables you to go on ‘auto-pilot’ when your pet needs you most. I have found that practicing on animal mannequins allows students to make a hand-to-brain connection aiding them in working on the real thing. Since I don’t teach yoga or meditation, I don’t claim to get my students into a “zen zone,” but what I do to alleviate their stress – which is so important since our animals pick up on our energy and vibes – is to teach them techniques and run scenarios through their heads so that nothing is brand new, and they have a plan A as well as a plan B in place. I teach my students to take a deep breath before running to the rescue, and before classes start, I spray my canine and feline mannequins with the calming scent of CANINE CALM to take the edge off, because I’ve noticed that if my students aren’t anxious about everything they have to learn, they stay more focused and soak it all in. I also suggest to them that during an emergency, they kindly ask any humans on the scene to leave who cannot remain calm. Send them for a bucket of water or a stack of newspapers, but get them away from the injured animal. Once you have taken a class, refresh your skills and take a class again because things change and our brains forget. CPR is now CPCR (again, the second “C” for cerebral means improved techniques for moving blood and oxygen to the brain), so keep up with cutting edge methods to help your four-legged friend when he needs you most. 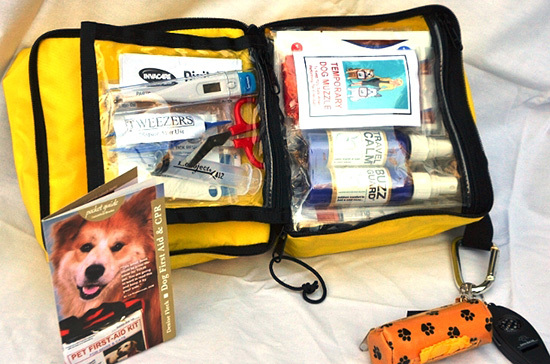 Do You Have An Up-To-Date, Easily-Accessible Pet First Aid Kit? In addition to knowing Pet First Aid and having the confidence to react, anyone who spends time around pets must have a well-equipped tool kit (aka your Dog or Cat’s First Aid Kit). Once assembled however, this kit is only as good as the human on the other end of the leash, meaning if you use something up, you must replace it; if an item expires, get another; and take special care of items that can go bad due to temperature changes. Medications and creams, adhesive on wraps and tapes as well as Hydrogen Peroxide all do not hold up well if they get hot. PET FIRST-AID HANDBOOK: To assist with the important details you need to know. PHONE NUMBERS & ADDRESSES: Keep this information regarding your Veterinarian and nearest Animal Emergency Center readily available. AROMTHERAPY MIST: To alleviate anxiety in both the injured animal and yourself as the rescuer. I love CANINE CALM by EARTH HEART because it smells really good and helps everyone relax. Your initial contact with the pet becomes a gentle bonding time, rubbing a little into the ear flaps and making them feel more at ease with what lies ahead. 3% HYDROGEN PEROXIDE: To flush minor wounds and induce vomiting due to poisoning. To induce vomiting, dribble 3% Hydrogen Peroxide into your pet’s mouth with a needle-less syringe. Dosage is 1 tablespoon per 15 lbs. of the animal’s body weight. Take vomit, poison container and your pet to the Vet or Animal ER as soon as possible. If poison was a caustic or unknown substance, you will be instructed to dilute (instead of inducing vomiting) by feeding your pet water or milk, or my favorite – non-fat plain yogurt. Activated charcoal (or even burned toast) may also be recommended to absorb the poison. Learn what to do for the various kinds of poisons, and have phone numbers nearby. EYE WASH OR SALINE SOLUTION: To flush minor wounds and clean eyes. Eye wash should be nothing more than purified water with salt, with no chemicals like those found in contact lens solution. 4” X 4” GAUZE SQUARES: To control bleeding. ROLLED GAUZE: To secure the gauze squares in place. ADHESIVE TAPE or SELF-ADHERING BANDAGE: To secure the gauze squares in place. COLD PACK: To aid in heat stroke, swollen joints, burns and bee stings. ANTIOBIOTIC OINTMENT or 15% TEA TREE ESSENTIAL OIL DILUTED in VITAMIN E GEL or PURE ALOE VERA GEL: To soothe and promote healing. NEEDLE-LESS SYRINGE or EYE DROPPER: To administer medications and other liquids. STYPTIC POWDER & COTTON SWABS: To control bleeding on a minor injury. SAFETY SCISSORS: To remove bandages or cut proper lengths of bandaging materials. TWEEZERS: To pull tick or remove debris from a wound. ANTIHISTAMINE TABLETS: For those times when a bee stings or a snake bites. Dosage is 1 mg per pound of pet’s body weight (ex. 10 lbs. cat gets 10 mg), but if your pet experiences major swelling or breathing difficulties, GET TO THE VET! ANTACID TABLETS: To soothe an upset stomach. ELECTROLYTE REPLENISHER: To aid in re-hydration. LEASH: To wrangle a pet in need of help or to use as a temporary muzzle. TOWEL OR BLANKET: To cover a pet who has gone into Shock OR to use as a sling or stretcher. How Can Pure Essential Oils Enhance Your Pet First Aid Kit? Products using pure essential oils are a safe and effective addition to your pet first aid kit. Pure essential oils are the volatile oils from the rind, flower, leaf, bark, root, or resin of aromatic plants that are released via steam distillation, cold expression or solvent extraction. Fragrance oils are synthetic, not therapeutic, and have been known to cause problems such as headaches, agitation or allergic reactions. Essential oils are very concentrated – for example, it takes about 200 pounds of flowering lavender tops to yield one pound of lavender essential oil – and so essential oils can be highly sensitizing or irritating to the skin when used undiluted. It is recommended that all essential oils be diluted before using, and you can make your own remedies or purchase many fine products that are safely diluted and ready-to-use. A dog’s sense of smell is remarkably better than ours. There are about 40 times more scent receptors than humans have, allowing dogs to identify smells between 1,000 and 10,000 times better than us. Dogs also have remarkable olfactory memory, and because their world revolves around scent, the use of pure essential oil remedies is ideal for use with them – using properly diluted essential oil remedies are not just safer for topical application but prevent overwhelm to your dog’s sense of smell. 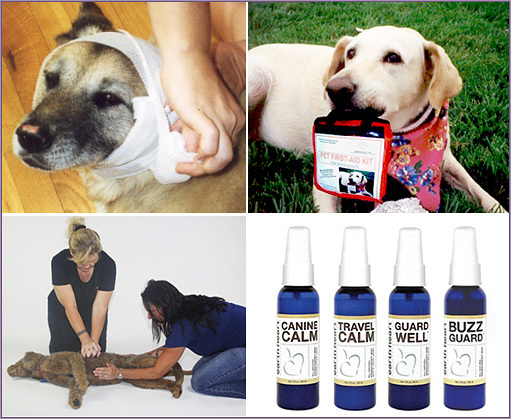 The Pet First Aid Kits developed by SUNNY DOG INK contain aromatherapy mists created by certified aromatherapist, Vicki Rae Thorne, who has been formulating essential oil remedies since 1992, and founded EARTH HEART in 1996. As mentioned above, I spray CANINE CALM on practice canine and feline mannequins to help students stay calm and focus (I know dog and horse trainers have used it for the same reason!). CANINE CALM combines pure essential oils that can relax your pet as well as yourself during emergencies. It can also help calm dogs during thunderstorms, fireworks and other loud noises, parties, training, competitions, adoptions, holidays, bath time, grooming, crating, separation, hospice, and clinic or kennel visits. If you or your pet experience nausea or vomiting during an emergency transport (or travel for pleasure), TRAVEL CALM uses pure essential oil of ginger, which is a proven remedy for stomach upset, along with essential oils for relaxation. This can be a welcome remedy to soothe restlessness, drooling, panting, whimpering and stomach upset during travel or transport. GUARD WELL contains the powerful yet gentle essential oils of niaouli, ravensare and frankincense, which have been used historically to help with skin and respiratory issues as well as overall health and well-being. It’s great in the first aid kit to help soothe dry, irritated or itchy skin after exposure to lawn or pool chemicals, cold or dry air, environmental irritants, viruses, bacteria, or long-term use of medications. Outdoor enthusiasts appreciate the BUZZ GUARD mist. Neem seed oil combined with pure essential oils help improve your dog's comfort in a variety of outdoor setting, any time of day or night, during outdoor activities such as walking, camping, hiking, boating, dog sports training, competition, and just having a good time in the great outdoors! How Can Scent Help Your Pet In An Emergency? Dogs respond well to scent and touch, and topical applications of properly diluted pure essential oil remedies such as the EARTH HEART mists can lead to an emotional response, coupled with a bonding experience and potential behavior modification. The scent itself can anchor a positive experience with a trusted caregiver, and the end result is comfort for both the animal and the caregiver. The scent molecules of pure essential oils enter the bloodstream through the skin when topically applied and through the lungs when the vapors are inhaled. Scent is the only one of our five senses that has an emotional response before a cognitive one. This is because the olfactory bulb has a direct link to the limbic system, the seat of emotion, memory and learning – for example, you don’t need to see a skunk to know it’s a skunk! Because of this “memoristic” nature of scent, I encourage pet parents to use the EARTH HEART mists at a nonthreatening time (like they are used in Pet First Aid classes), so the dog can associate that scent with a person of comfort and safety, rather than using it for the first time in an emergency situation. Sometimes a particular essential oil can be chemically sedating, but because of a bad memory associated with it, actually causes agitation. Can Products Containing Pure Essential Oils Be Used With Cats? Many cats react negatively to some essential oils, and experts are not in agreement regarding safety issues with cats. It is generally believed that very limited exposure to high quality, properly diluted pure essential oil products, such as EARTH HEART mists, or keeping your cat calm during an emergency is ok.
Can Products Containing Pure Essential Oils Be Used With Puppies? The EARTH HEART mists can be used with medium to large breeds from 8-weeks old, and for small breeds from 10-weeks old. Every home and vehicle should have a comprehensive first-aid kit. Don’t find yourself wishing you’d learned Pet First Aid and assembled a kit. Gather the tools now and learn how to use them for times your pet may be counting on you. Permission to use this article is granted by Denise Fleck, certified Pet First Aid & CPR instructor, author, creator of Sunny-Dog Ink Pet First Aid Kits. Denise Fleck is an award winning author and freelance writer. 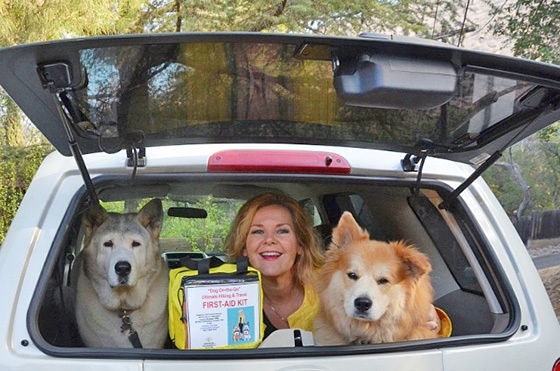 After extensive training, practice, more training and more practice, she developed her own Pet First-Aid & CPR curriculum and has been teaching animal life-saving skills for 15 years with many success stories to share. She also developed and teaches an Animal Care course through the Burbank Unified School District and has demonstrated animal skills on CBS –TV’s “The Doctors” and Animal Planet’s “Pit Boss,” along with other shows. To complement her teachings, Denise created a line of Pet First-Aid Kits, posters and books for children teaching animal respect and care! Earth Heart has a long-standing reputation for designing effective natural remedies using plant-based ingredients that help dogs live happier, healthier lives. Vicki Rae Thorne, certified aromatherapist and herbalist, founded Earth Heart in 1996 to help others learn how to safely and effectively use herbs and essential oils as part of everyday life. Earth Heart mists are made in the USA, packaged in BPA free recyclable containers, easy to use, and can be sprayed directly onto cloth, skin or fur without staining or leaving a sticky residue. 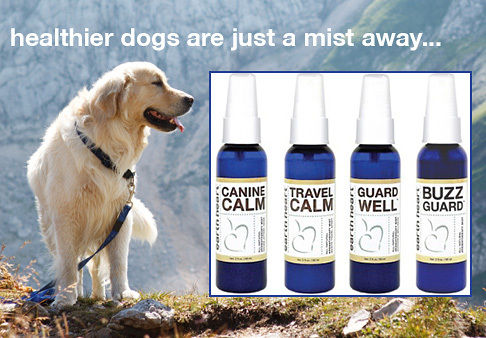 Feedback from dog lovers and professionals across the USA and Canada has shown that Earth Heart mists provide safe, easy, effective solutions for over 90% of dogs.